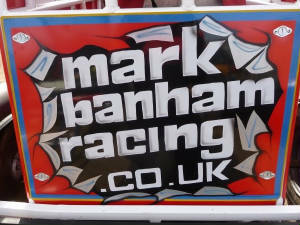 First meeting of the 2009 season with the kart sporting new panels, paintwork and signwriting. In front of decent sized crowd for the StockKarts first appearance at Swaffham Raceway since June 2006 (this time with Swaffham being run as an independent track rather than being run by Spedeworth). Unfortunately due to adjusting the lap belts I did not make it on track for practice. I opted for too low tyre pressures for heat 1 which meant that the kart lacked a bit of drive and so I was reasonably pleased with 6th place. Got a hit up the rear early on to christen the new kart and generally I was not far off the pace of the leaders before being delayed by a backmarking kart over the closing laps. For heat 2 I set the tyre pressures higher but this seemed to be too high as the kart seemed to be bouncing constantly around the bends where I was struggling to keep four wheels on track! I ended up driving most of the race defensively and then on the last bend opted to go around the outside of a spun kart and dropped from seventh to eighth in the drag race to the line. For the final (2009 East Anglian Championship), I unsurprisingly opted for tyre pressures somewhere between those for heat 1 and heat 2! I felt that the kart was quicker and I was running well in 6th on the tail of the front runners when the last of these spun right in front of me and by the time I diverted around the outside and recovered a half spin the leaders were gone and I was left to battle back up from seventh to sixth. Whilst I was a little disappointed with my results, the day was very enjoyable and it was great to be back out on track again. We were made to feel very welcome at a track with a very pleasant 'club' feel to it. Heat 1: 6th, Heat 2: 8th. 2009 EAST ANGLIAN CHAMPIONSHIP: 6th. POINTS 27 (including 5 attendance points). New Kart featured in April edition of Short Circuit magazine. This was run in graded order in front of a big crowd and although a few star drivers were missing, it was still going to be hard work starting towards the rear of the field. The track was in excellent condition and the kart felt good - putting in a quick practice lap before lining up! The first bend was full of incident after which I was up to 4th place. By the end of the first lap I was right behind 3rd and gave a big push going into turn one. This is when it all went wrong and the kart lost all drive. I managed to drift down the back straight before stopping on the outside of turn three where I sat to watch the rest of the race. After climbing from the kart once the race had finished it became clear that the chain had fallen off. With the kart running well and a good start it is certainly a case of what might have been...that's motor racing! WORLD CUP RACE: DNF. POINTS 5 attendance points. What could be better than a week long holiday combined with some racing in front of a good sized crowd? A stop over and trip into Newcastle on the way up, an invite to a 30th birthday party on arrival plus some Scottish sightseeing! Slight problem when the kart would not start meaning that it required a jump start all day. Great days racing - fast and close - with some respectable results racing against considerably more experienced drivers. Heat one went well and I managed to nudge my way up to 4th and although I was battling and nudging to try and find a way past 3rd there was no way through. Heat 2 again went well and again I managed to get up to a respectable 4th place. The final was again a good race and at one point I was briefly up to 4th but in the end had to settle for 5th. A bonus for the afternoon was an unexpected Grand National and I made a quick start and was up to 2nd. I was chasing 1st before losing out over the closing laps and eventually finishing 5th. Heat 1: 4th, Heat 2: 4th, Final: 5th, Grand National: 5th. POINTS 35 (including 5 attendance points) + 10 Grand National points. New Kart featured in June edition of Karting magazine. A fun and enjoyable days racing in the wet at a rain soaked Swaffham. There was still a decent sized crowd despite the weather but the day started ominously when the kart would not start! A quick prognosis of a defunct battery and the acquisition of a new battery from the Anderson Racing Team and away I went for heat 1. The problems with the battery meant that I did not get a chance to change any tyre pressures and so being only my second meeting on wet tarmac, the first being the 2007 World Cup at Ipswich, I took things steady. What great fun! Visor up and a face full of water or visor down and not being able to see? Visor up and then turn when you see the corners! Smiling all the way and with no spins I finished 5th. Leaving the tyre pressures as they were, I got off to a bad start at the beginning of heat 2 but with no spins again, I recovered to finish 4th. Again leaving the tyre pressures as they were, the final went well. Running 6th, a couple of drivers spinning out put me 4th and on the tale of 3rd (and a podium place! )...this opportunity was too good to miss and a couple of nudges helped me up to 3rd and I was not going to be denied a first ever lap of honour over the closing laps! Great fun racing in the wet a first ever lap of honour - excellent meeting! Heat 1: 5th, Heat 2: 4th, Final 3rd. POINTS 38 (including 5 attendance points). Swaffham Final presentation photo featured in August edition of Short Circuit magazine and September edition of Karting magazine. With the kart having been cleaned up since Swaffham, it was off to Coventry for the 2009 World of Shale race. This was again run in graded order in front of a big crowd. More kart starting problems unfortunately and whilst the problem area is being narrowed down I was not in the best frame of mind heading out on to track. The kart felt good after a couple of warm up laps but I mis-timed my start and rapidly dropped to last. I battled back up a few places but went outside when I could have gone inside to avoid a spinning kart and then was not decisive enough when behind a kart that had recovered from a spin. Nevertheless, I was up to 6th and when behind another kart that had recovered from a spin, I was not aggresive enough when putting the front bumper to use! So a 6th place finish it was but not too far behind the front runners. A little bit disappointing as I feel that a better result was there for the taking if I had been a bit more aggressive but as was correctly pointed out this was my first full race on shale since the corresponding meeting last season. With the kart cleaned up following Coventry, the battery problems hopefully diagnosed and the battery recharged it was an early morning start for the trip to Buxton. With my previous visit to Buxton in 2007 being a bit of a wash out, it was good that the forecast this time was for nice weather. Although having not felt too well the day before, it was touch and go whether I would be able to make it but after a decent night's sleep off I went! That was not the end of the 'wondering whether I would make it' as I then was stuck at a standstill in traffic on the M1! Thankfully that cleared and eventually we made it to Buxton and the weather forecasters had got it right! Practice went well and proved what a great but tricky StockKart track the Buxton Speedway. I was on the pace of another couple of karts including the World Champion although we were all soon caught by another kart! The first heat started well and I was up to second and made a move for the lead just as I got nudged into a spin. I got a bit bogged down in the deeper shale on the outside of the bend and by the time I was able to safely rejoin, I was a lap down. I finished 6th. The second heat again went ok but was very dusty and I finished 4th. The track had been watered ahead of the final and I made an ok start. All the karts became bunched up and as I nudged another kart my kart spun across the track in front of an oncoming kart which completed my spin on to the centre green! My kart promptly became stuck! I rejoined the track for the grand national which I took steady concerned whether damage had been sustained in my crash during the final. I was in 6th and just missed out on 5th in the final run to the flag at the end. A visit to friends in the area completed a good day out even if results could have been a bit better. Heat 1: 6th, Heat 2: 4th, Final DNF, Grand National: 6th. POINTS 19 (including 5 attendance points) + 9 Grand National points. With the kart cleaned up following the previous Buxton, the starting problems reappeared but with assistance to start I was able to compete in all races! Practice went ok but following this and the previous meeting I decided to try higher tyre pressures for the racing. The first heat started well and I was in third before getting nudged wide and recovering in 6th. Following another nudge wide, I was down to 7th but I was able to reclaim a place with a dive up the inside of another kart. I then managed to dive up the inside of two clashing karts down the straight but unfortunately, I carried too much speed into the corner and as I ran wide the two karts re-took me on the inside! The second heat went much better. Athough at one point I was 5th, I moved up to 4th and then 3rd before slipping back and finishing 4th. In the final I was running 3rd before before being nudged down to 4th, then 5th, then 6th and then 7th! I remained 7th for much of the race before another kart spun and I was up to 6th which is where I finished. I was 3rd for the early part of the grand national on the tail of the front two who were locked in battle. Unfortunately, I just could not quite get close enough to nudge one of these in the hope that it would have a knock on effect to the other! I then slipped down to 5th which is where I finished. Combined with a long weekend camping away with the families of fellow drivers Chris Butcher and Lee Anderson which included visits to the Alton Towers theme park and the Alton Towers Waterpark on the preceding Thursday and Friday respectively plus taking in the second Brisca F1 Stock Cars World Championship semi-final at the Birmingham Wheels on the Saturday evening, it was an enjoyable few days away! Heat 1: 6th, Heat 2: 4th, Final 6th, Grand National: 5th. POINTS 31 (including 5 attendance points) + 10 Grand National points. Rounds 10 and 11 of the StockKart National Points Championship saw a second trip of the year ‘North of the Border’ to take on my Scottish counterparts in their own backyard. Although in May, it was a more leaisurely journey up and back as this trip was completed in 4 days. Travelling began on the Thursday afternoon before a stop over at Rugby and then up to Scotland on the Friday. The destination was the UK’s most northerly track for the Crimond Raceway Speedweekend on 12th and 13th September. Each round consisted of a heat and final whilst the weekend racing would conclude with the coveted Scottish ‘Open’ Championship on the Sunday. All the races would also determine the winning team for the England v Scotland ‘Bannock Burn Bash’ Trophy sponsored by Scottish driver Lee Anderson and English driver Chris Butcher. An eventful weekend began with practice on the Saturday afternoon and having initially thought that my starting problems had been cured they returned and I missed the first session. Having missed the first session, for the second session, I started at the back so that I could find my pace and I was able to catch a few karts before dropping back again to find space. For the third session, I started in the middle of the pack and was on the pace. In the first heat, I got up to 5th on lap 3 by passing a kart on the outside that was avoiding a spun kart brushing the tyre wall in the process! I lost places having had to momentarily lift off when on the outside of a kart that got out of shape coming off a bend. I gained a place back and then another place when a kart pulled out with a broken throttle return spring and eventually finished 7th. In Saturday’s final, I was up to 4th on lap 2 and stayed there until lap 8 when I was nudged wide and passed by a train of three karts. I gained a place when a kart dislodged a chain when spinning into the inside armco and finished 6th. On to the Sunday and in the heat I dropped to 10th and although I was on the pace I was unable to make progress up the order until I passed a kart that spun to finish 9th. A similar story in Sunday’s final except this time I was unable to make progress up the order despite a yellow flag for stray metal work on the track from another kart bunching the karts up…another missed re-start! The 20 lap Scottish ‘Open’ Championship was lined up in grid order based on the drivers points from the weekend’s races – I started 10th. After a hectic start to the longest race of the StockKarts season I was up to 8th before dropping back to 10th at the finish. All in all a brilliant weekend even if a little bit frustrated with my results on the Sunday. Good news though as when the team points were added up the English team had won the ‘Bannock Burn Bash’ Trophy by a mere three points: 138-135. After receiving generous applause on my second ever lap of honour from the appreciative Crimond Raceway spectators, me and the rest of a jubilant England team set off back ‘South of the Border’ arriving back home on the Monday. Special thanks to Scotland’s Chief Mechanic Michael Skeen in jump-starting my kart all weekend – reflecting the spirit that exists in the StockKarts formula! A back injury picked up on the Friday before this meeting (lifting my fiancee's niece at a wedding!) originally ruled me out of this meeting as I was unable to fully stand up straight first thing in the morning! I was disappointed to not race at the final meeting of the season especially as my last race at Swaffham in June had ended with 3rd in the final and my first ever lap of honour! I made the trip, with kart, to Swaffham so that I could watch and also see if my kart could be lent out to another driver. As my back began to ease during the day, I decided that if it was still ok then I would attempt one go. I avoided practice and decided that if I was going to race then it would be in the final as this offered the most points. My kart was lent out for the heats and finished 6th in both. Unfortunately, I dropped to 6th in the points as the driver who was 6th also won the final to finish just 7 points ahead. FINAL: 6th. POINTS 17 (including 5 attendance points). A proper full season with a new kart paint scheme, lots of travelling (including 2 trips to Scotland) and a mixture of good and not so good results. This helped me to learn a great deal both on and off the track but now need to find more consistency. Getting married towards the end of the year meant obvious time restrictions but without sustaining injury prior to the final round: 6th in the final National Points standings could have been 5th! The season highlight was my 3rd place finish in the final at a wet Swaffham on 7th June to earn a first ever lap of honour...this was followed by a second lap of honour as part of the winning 'England' team in the 'Bannock Burn Bash' Trophy at the Crimond weekend in September. The not so good being the kart chain falling off early on when well placed in the World Cup race at Coventry in April. I will begin the 2010 season graded as Superstar.